Written By: James Mather, Stephen St. Leger, and Luc Besson, from an original idea by Besson. Starring Guy Pearce, Maggie Grace, Peter Stormare, Joseph Gilgun, Lennie James, and Vincent Regan. During the penultimate scene of Lockout, a high concept B-movie action flick, a character monologues to our hero, the grimy renegade Snow (Guy Pearce). “You’re all relics of a dead time!” he posits. This character (going nameless for spoiler sake) seems to simply be delivering plain dialogue that the screenplay requires in order to make him out to be the villain. Or it could be a meta-commentary on the whole feel of Lockout, which borrows heavily from the B-movies of the 1980s. The problem is, however, Lockout isn’t sure whether to fully embrace its own absurdity, and meanders between the two worlds. 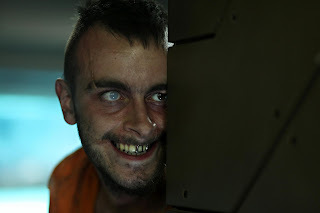 Produced by Luc Besson (The Fifth Element), Lockout may have fared better if it had been called Space Jail, as a number of other film critics have declared. 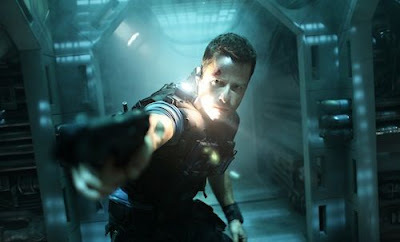 Lockout certainly is a film destined for late night TV marathon status; it’s about a jail full of dangerous criminals, but the jail is in space! What else do you need to know? And while Lockout isn’t sure what it really wants to be, it manages to be a distractingly good time. Much of that can be credited to Pearce, breaking out of his usual prestige shell for something much more in the Kurt Russell vein (Escape from New York, among other John Carpenter films, is the essential template for Lockout). Full of nippy one liners and a casual attitude (even when blowing up things…in space! ), Pearce fills into the role smoothly, and his sly performance carries Lockout during its more meandering times. The plot begins with a double crossing as Snow (Pearce), an ex-CIA operative, is arrested for stealing codes for a McGuffin that will give him the chance for a redemptive get-your-freedom mission. You see, the president’s daughter has been taken hostage on MS-1, also known as THE SPACE JAIL. And as one character suggests, they could send in a team of marines, but this is a mission better suited for one man (to be fair, a subplot that bookends the film does justify all this tomfoolery). So Snow must infiltrate the worst criminals, whose minds have been corroded from their Alien-style slumber to prey on the weak, while the poor president’s daughter remains in trouble. She’s played by Maggie Grace, who also played the same role in the Besson-produced Taken. To be fair, Grace does get some back and forth quips with Pearce that attempt to mimic the usual banter contained in these films, and does the best she can with the questionable material. Frustratingly, Lockout never truly embraces its camp. It plays to the formula, and avoids anything quite risky. Its visuals are full of dark and murky corridors, and few set pieces stick out (though a few of the shoddy CGI moments did give a large laugh). I enjoyed my time on Space Jail, but I also wished the film could have gone further into the bizarre. Making a self-aware film is all the hype these days, and Besson’s best work remains those that embrace their clichés and go over the top. Perhaps when they rebuild MS-1 for Space Jail 2: Snow Storm, well, the camp’s right there in the title.